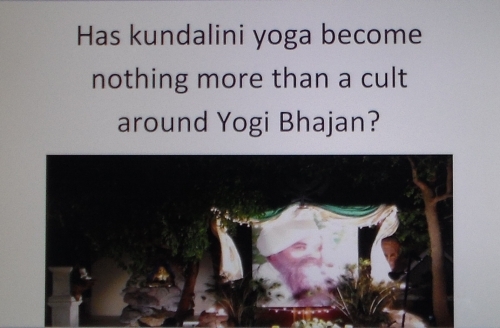 3HO & kundalini yoga : Nothing more than a Yogi Bhajan cult? Did Yogi Bhajan design his tantric / Kundalini Yoga for mind control cult induction? In this video I discuss how Yogi Bhajan designed his kundalini yoga to create hypnotic states in order to control minds and make his students more susceptible to induction into his cult. Yogi Bhajan puts tantric / kundalini yoga cult before parent's care of their children! Yogi Bhajan's Chief of Protocol & right-hand man, Hari Jiwan Singh, has been auditioning for Yogi Bhajan's job lately. Among other bids for recognition was an entire letter Hari Jiwan published from Yogi Bhajan addressed to The Chief's seven-year-old daughter that HJS included in the Oct. 2 letter he titled, "Yogi Bhajan, Coherence of Parents." The little girl had been shipped off to India along with her sister. HJS reveals that he didn't want to send his daughters away but he put his Master before his family. This is 6 minutes of deprogrammer Steve Hassan discussing people in high demand totalitarian groups whose primary loyalty in life is to their leaders rather than to their children. It's from a Massachusetts School of Law panel discussion. The groups referred to range from the Hare Krishnas to the Nazis.